Spinner Anti Down Draught Chimney Cowl Terracotta 8/9"
The main purpose of the Terracotta Spinner Anti Down Draught Chimney Cowl is to prevent the penetration of the chimney by moderate or severe winds which causes smoke to escape from the open fireplace or stove or any other appliance. Its response is immediate because of its double bearing pivot action. 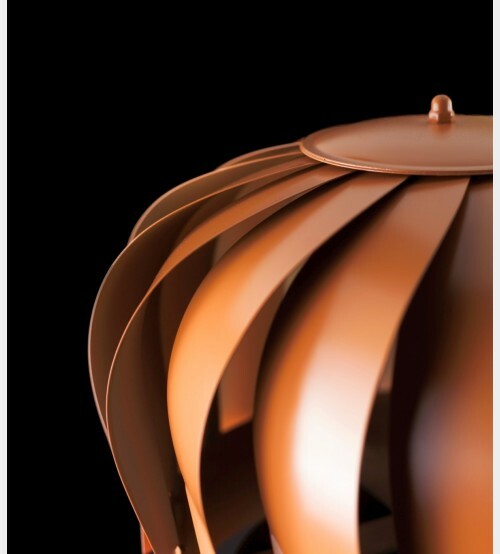 The more severe the wind – the more effective the Terracotta Spinner cowl becomes. 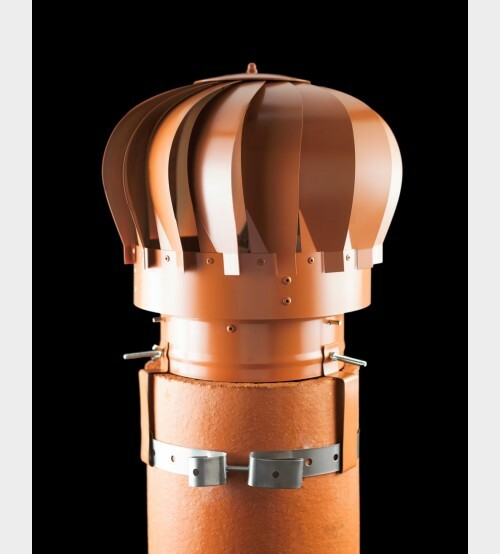 When revolving, the Terracotta Spinner Anti Down Draught Chimney Cowl also ventilates the chimney shaft helping keep it dry and it can also help prevent back up smells coming down into the room via the fireplace or stove. Does not impede the performance of the chimney in any way. Chimney Cowls are also known as Chimney Pots, Chimney Hoods or Chimney Caps. There are various names for these products but they are originally called Cowls. Because we are so confident in the Spinner’s quality & durability we offer a 1 year guarantee against any defect in workmanship & materials. The high grade stainless steel construction & finish is of the best quality. Has been tested for many years in the most varied of weather conditions & has proven to be successful in solving downdraught problems, regardless of wind severity. Should not be used with Anthracite fuel or fuels high in sulphuric acid. This cowl will not prevent a draughting problem when there is no wind – if the problem still exists when there is no wind (in conditions such as cold, calm and frost) the problem is a lack of draught (not a downdraught) and a motorised chimney cowl is required such as the Super C Electric Fan Cowl No anti down draught chimney cowl can solve a lack of draught. Will fit most standard chimney pots - the Terracotta Spinner’s base diameter is 8” or 200mm. 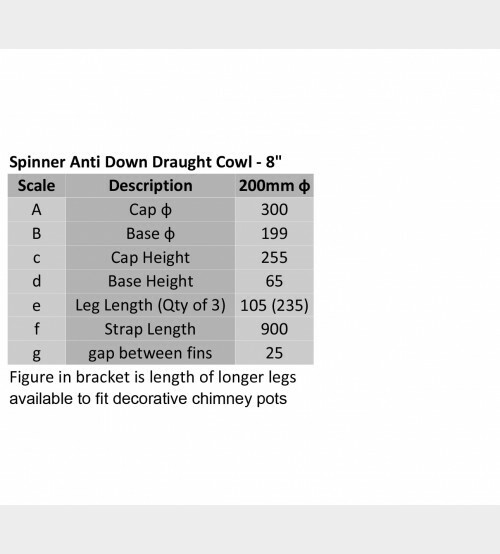 To fit the Terracotta Spinner to a 6” chimney pot – a 6” Spinner Adapter must be purchased. The Terracotta Spinner Anti Down Draught Chimney Cowl is very easy to install – only a screw driver is required. Fitting instructions supplied with each product. To fit the Terracotta Spinner to a prefabricated or insulated flue – a Spinner Adapter must be purchased. We sell Spinner Adapters in sizes 3”, 4”, 5”, 6”, 7” and 9”. You can view the various Spinner Adapters by viewing Chimney Cowl Accessories. The Terracotta Spinner Chimney Cowl incorporates a simple yet effective system of attaching closely to a chimney pot or Spinner Adapter. Claws & strapping legs are held in place by 3 wing-nuts & a tightly fitting strapping band. There is no drilling or measuring involved in fitting this cowl. A screwdriver is the only tool required. 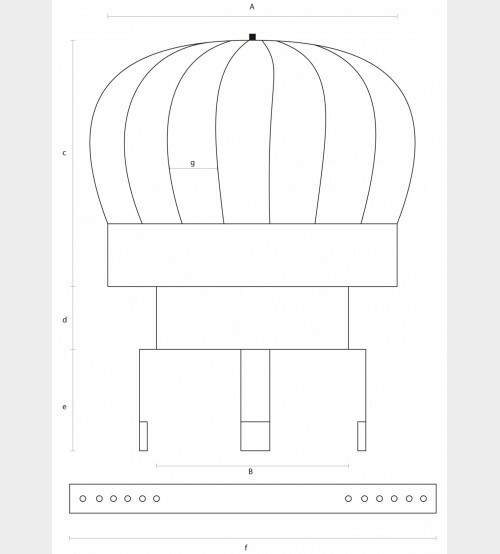 Full fitting instructions are supplied with each cowl.